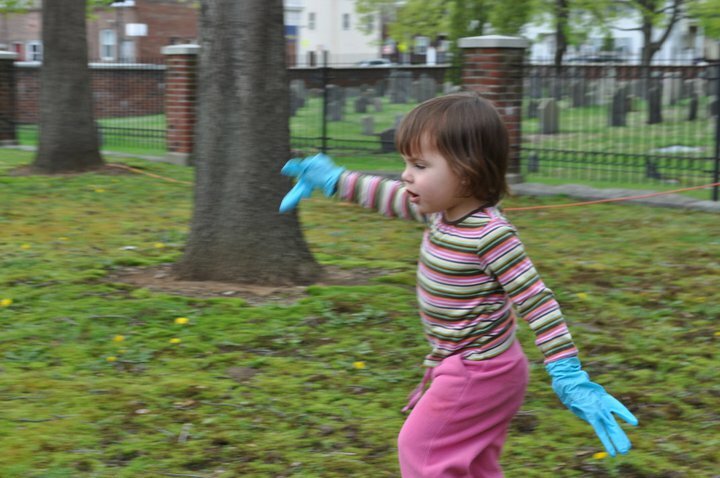 ...by volunteering at the Second Annual Medford Square Clean Up on Saturday, April 28th. Green Medford, the City of Medford, and several other organizations are partnering to give Medford Square a good spring cleaning in honor of Earth Day. The cleanup and related activities run from 9 am to Noon. Volunteers will also be able to participate in green art projects, games, live music, and other activities. Mystic Coffee Roaster and Donuts with a Difference will provide morning refreshments, and other local food will also be featured. The event will begin behind City Hall at One City Hall Mall (Riverside Ave & Clippership Drive), the future site of the Medford Farmers Market. At 9:30 am Mayor Michael McGlynn will welcome the crowd and announce the new Medford Green Awards, after which the cleanup kicks into high gear to neaten and beautify the Square, Clippership Park, and other adjacent areas. Other activities will include a recycling relay race for kids, a free community yoga class, 10:00 am at Clippership Park (rain location 45 Riverside Ave), and green art-making—for kids, artists, and those who wish they were—at the brick plaza on Riverside Ave from 10 to noon. In addition to the Medford Square Clean-Up, two other neighborhood cleanups are also being held the same day—one sponsored by the Friends of the Mystic River from 9:30 am to 2:00 pm at Riverbend Park, and another by the Mystic River Watershed Association, in Somerville. West Medford Open Studios will also be taking place from Noon to 5 pm both Saturday and Sunday, and volunteers are encouraged to support our local artists by visiting some of the 70-plus artists in sites all over West Medford. The cleanups are part of Mystic Community Earth Day, which includes many events in Medford, Malden, and Everett. This year we are proud to be working with the following community organizations: Awakened Warrior Yoga, Boys and Girls Clubs of Middlesex County, Friends of the Mystic River, G&S Music, GreenUp CleanUp, Green Medford, Medford Chamber of Commerce, City of Medford, Medford Farmers Market, Medford Health Matters, Mystic Coffee Roaster, Mystic Community Earth Day, Mystic River Watershed Association, Next Step Living, Tri-City Community Action Program (Tri-CAP), Tufts University, West Medford Open Studios, and Xtreme Ninja Martial Arts Center. See all the pictures from last year's cleanup here. CONTACT: For more information, email greenmedford@gmail.com, contact Susan Altman at 781-526-4714, or visit www.greenmedford.blogspot.com. Also see www.fomr.org for information about the Friends of the Mystic River cleanup,www.mysticriver.org for more about the Mystic River Watershed Association cleanup, andwww.wmos.org for details about the West Medford Open Studios.